Operation of a community drinking water distribution system is regulated under provincial legislation; the BC Drinking Water Protection Act and the BC Drinking Water Protection Regulation. The provincial government issues permits to operate a Drinking Water System. Our Operating License is issued by Ministry of Health Services. Water systems are classified by Environmental Operators Certification Program Society of BC (EOCP) in to one of the following categories: Small System, Level I, Level II or Level III. Kemp Lake Waterworks District is currently considered a Level I water system. 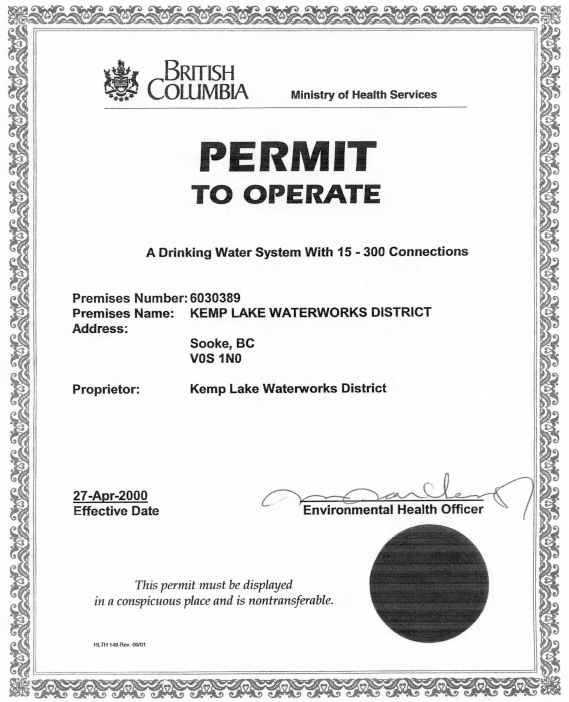 Effective January 1, 2005, Section 12 of the Drinking Water Protection Regulation requires that the principal operator of a water system must hold a valid Environmental Operators Certificate of the appropriate level, issued by the Environmental Operators Certification Program Society. 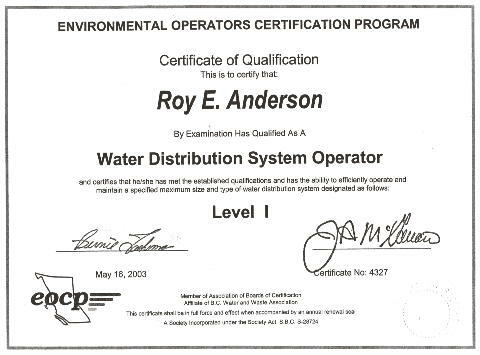 As a Level I water system, Kemp Lake Waterworks District requires the principal operator to have a Water Distribution Level I operators certificate. In the late 1990s, Kemp Lake Waterworks District initiated certification of our operators and our principal operators have been certified since the fall of 1999. 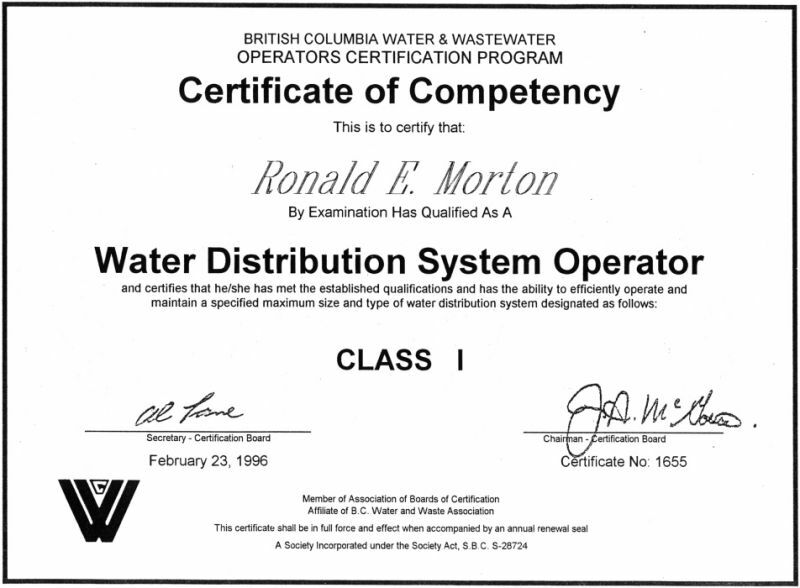 As well, one of our assistant operators hold certification at Water Distribution Level I.
Roy, who had been working under the direction of Jarvis for a number of years, is now our principal operator. He received his certification as a Level I operator in spring of 2003. Ron Morton received his certification as a Level I operator in 1996 and was our primary operator for a number of years before stepping back from the role of primary operator. Ron, who is semi-retired, continues to work for the district during the summer months. Ray Fiset received his certification as a Level I operator in 2013. Ray has been working under the direction of our primary operator, Roy, for the past year. Trevor Davidson is our meter reader. He also does the brushing out/weed eating around the hydrants, standpipes, pump houses and reservoirs of the district. Occasionally he helps with the maintenance work under the supervision of one of our operators. Some of you may have seen him in his orange coveralls along the roads of the district as he moves from meter to meter. Meter reading is done around the end of the toll period. Although the toll periods are at the end of March, June, September and December, the meters can be read anytime from a few days before the end of the month to a few days after depending on Trevor's availability, the weather and other factors. John McCrea and Paul White also help out with maintenance and repairs on a regular basis, working under our lead operator. There are a number of other individuals that we can call on as needed to provide help on larger maintenance or repair projects.